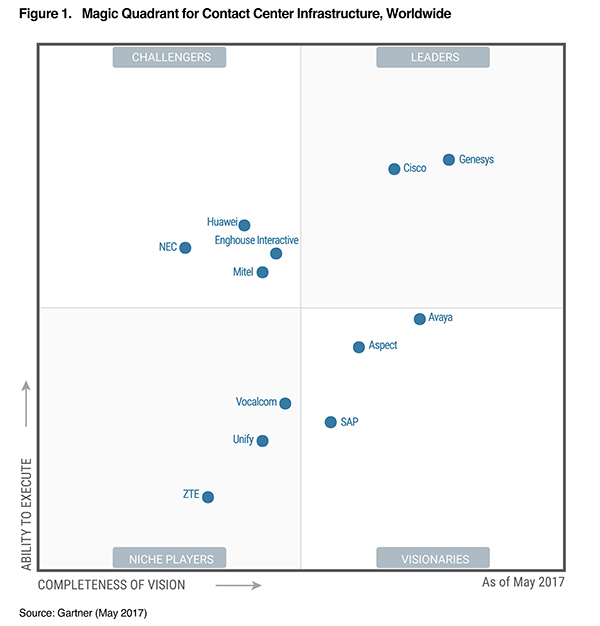 The 2017 Magic Quadrant provides Gartner’s annual analysis of the contact center infrastructure vendors. The report examines the innovations driving the market and compares vendors based on completeness of vision and ability to execute. For the ninth year, we are honored to be positioned as a leader in the 2017 Gartner Magic Quadrant for Contact Center Infrastructure, Worldwide. Gartner placed Genesys highest amongst all vendors in ability to execute and completeness of vision. We believe this unique position validates our mission to power the world’s best customer engagement solutions for organizations of all sizes, both in the cloud and on premise.